I am sure you know the name Samuel Taylor Coleridge (1772–1834). You might even be familiar with the English poet’s ‘Rime of the Ancient Mariner’, or perhaps these lines ring a bell from your school days: ‘In Xanadu did Kubla Khan / A stately pleasure-dome decree’. But you may be less familiar with the name of Coleridge’s grandson, Derwent Moultrie Coleridge—a clever but reckless man with a fondness for beer. I’d like to introduce you. Freeman’s Journal. 11 Dec 1880, p. 11. Was alcohol really his undoing? Did he rebel against the elevated standards set by his family? And how did he come to end his days in the colony of New South Wales? Let’s go back to the year 1828. Coleridge was born on 17 October in that year in Helston—a village roughly equidistant from Penzance and Falmouth, on Cornwall’s Lizard Peninsula—where his recently ordained father had accepted the curacy of the local parish. 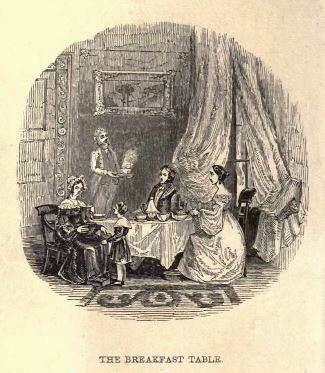 The Coleridge family’s social connections included the historian and politician Thomas Babington Macaulay, the poet Chauncey Hare Townsend (later Charles Dickens’ literary executor), and the cleric and hymn writer John Moultrie. Another family friend was Coleridge’s godmother Emily Trevenen, herself an acquaintance of William Wordsworth and a friend of Charles and Mary Lamb. When Coleridge was still a boy, Trevenen published a small book of poems for him—Little Derwent’s Breakfast. The weight of family expectation! Coleridge, as his godmother desired, did continue to learn. (Well, he continued to be taught, which is not quite the same thing.) But whether he avoided thoughts and deeds of which his famed grandfather would have disapproved is rather less certain. His schooldays over, Coleridge went up to Exeter College, Oxford in 1847. Perhaps this is where his fondness for beer begins to influence his behaviour. Remember the South Australian Register’s Anglo-Australian correspondent who I mentioned earlier? He wrote that, at Oxford, Coleridge ‘was the fastest of the fast, and soon made the University too warm for him. Clever he was, but foolish … This was his character—utterly thoughtless and reckless.’ (Shades of Jane Austen’s George Wickham.) His cleverness does not seem to have tempered his recklessness. In Joseph Foster’s Alumni Oxonienses, a biographical register for all students who came up to Oxford until 1886, Coleridge’s entry is modest. There is no mention of his gaining a degree and no departure date is recorded. But depart he did. According to the erstwhile Register reporter, when Coleridge ‘came down from Oxford for the vacation he turned his father’s Training College upside down with his mad pranks, and made all the grave youths training for school masters as wild as himself’. One suspects his behaviour did not commend him either to Oxford or to his family in London. Where to next, then, for the dissolute son of an esteemed educator and grandson of a celebrated poet? Perhaps some family strings were pulled. In an unusual move for the time, Coleridge was admitted to Jesus College, Cambridge, on 3 July 1850. His admission was based on the recommendation of the Reverend Richard William Jelf, principal of the young man’s former school, King’s College. Coleridge’s paternal grandfather had studied at Jesus College and his father was a student at another Cambridge college, St John’s. In a further anomaly for this era, Coleridge’s entry in Alumni Cantabrigiensis records no county of residence, nor is a place or date of birth provided. It is as if the young man slunk incognito into ‘the other place’. He may also have slunk out again rather quickly. Although Alumni Cantabrigiensis confers on Coleridge the degree status ‘Bachelor of Arts’ in 1853, it is quite possible he did not successfully complete his studies and was not even still in England by that time. 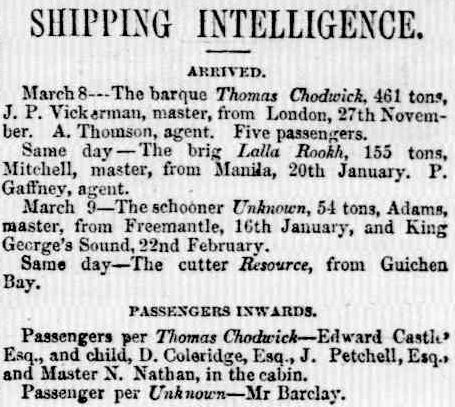 His name does not appear in the 1851 UK Census, but it is included in the list of ‘Passengers Inwards’ who arrived at Port Adelaide on board the Thomas Chadwick on 8 March 1851. The ship had left London in November 1850. Adelaide Times. 10 March 1851, p. 2. With his family probably in equal parts embarrassed and demoralised by his ongoing recklessness, Coleridge had been ‘packed off to Adelaide with a comfortable sum of money to try and be steady in the antipodes’. But it seems ‘the glorious climate of the sunny south was too intoxicating’ and Coleridge’s money was soon gone. The Register’s correspondent says that within a year the profligate youth had to ‘fall back upon his own resources and his university career’. The Argus. 4 July 1859, p. 8. Stay tuned for Part II of Derwent Moultrie Coleridge’s peripatetic antipodean tale. My thanks to the archivists at Exeter and Jesus Colleges, Oxford; Jesus College, Cambridge; and the Charterhouse School, London; and to the present incumbent of St Michael’s Church, Helston. All were generous in searching out and sharing information on Derwent Moultrie Coleridge. You can find some of Samuel Taylor Coleridge’s poems, including ‘The Rime of the Ancient Mariner’, on the Poetry Foundation’s website. ‘Family Notices.’ Freeman’s Journal. 11 Dec 1880: 11. ‘Anglo-Australian Gossip.’ South Australian Register. 9 Jan 1883: 5. 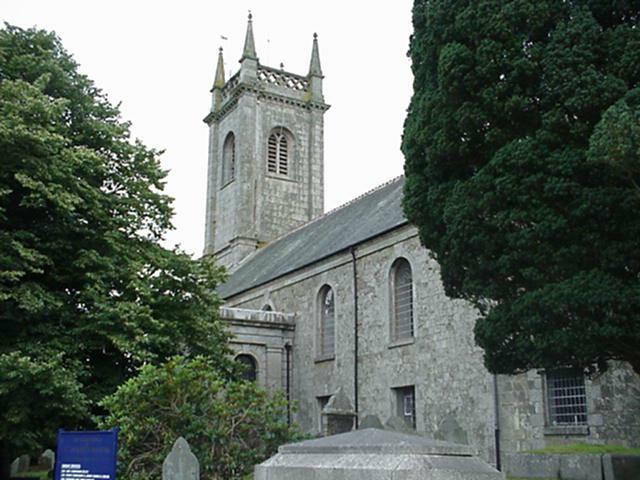 St Michael’s and St Wendrona’s, Helston and Wendron. Trevenen, Emily. Little Derwent’s Breakfast. London: Smith, Elder & Co., 1839. ‘The History of the London Charterhouse.’ The Charterhouse website. Durrant, Cherry. ‘Coleridge, Derwent (1800–1883)’, Oxford Dictionary of National Biography, Oxford University Press, 2004. Online edn. ‘Shipping Intelligence.’ Adelaide Times. 10 March 1851: 2. ‘Advertising.’ The Argus. 4 July 1859: 8.